Cats seem to be able to sleep anytime and anywhere. But contrary to a popular notion, they’re not feline Rip Van Winkles. 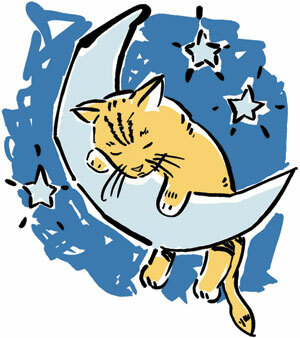 When cats nap, their bodies and minds are operating in essentially a standby mode, says Dodman. During a nap, a cat is similar to an idling car engine, which can be put into “drive” at a moment’s notice—especially if a cat senses prey nearby. That said, adequate sleep is important to a cat’s health, longevity and mood, and changes in sleep patterns may signal illness. Cats with hyperthyroidism or hypertension, for example, may sleep less and be more active than usual. In both cases, cats may vocalize at night, loud enough to wake their owners. Cats infected with feline immunodeficiency virus (FIV) often sleep less, much as people with HIV do. Sudden bouts of prolonged sleep are more indicative of poor health and can indicate such conditions as kidney disease, diabetes and heart disease. If you notice your cat is sleeping more or less than usual, talk to your veterinarian to make sure any potential health issue is addressed early. Adapted with permission from Catnip: The Newsletter for Caring Cat Owners, published by the Cummings School of Veterinary Medicine. For subscription information, go to tuftscatnip.com or call 1.800.829.0926.